February 2017 – Page 81 – Welcome to Wyandotte Daily! 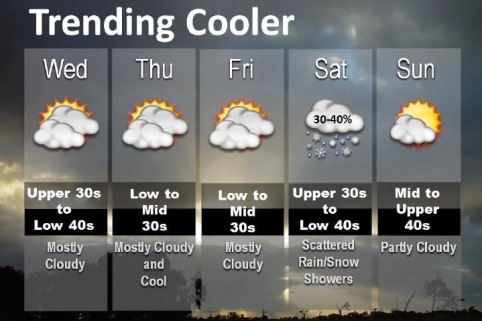 Today’s high will be about 43 degrees, according to the National Weather Service, with cooler temperatures coming on Thursday and the weekend. The next chance for rain will arrive Saturday, and there is a chance of rain and snow on Saturday night in the region, the weather service said. No accumulation is expected. Sunday will start warming up again. Today, expect partly sunny skies and a north wind of 7 to 9 mph, according to the weather service. Tonight, the temperature will drop to a low of 22, with partly cloudy skies and a north wind of 9 mph, the weather service said. Thursday, the high will be near 33, with partly sunny skies and a north wind of 5 to 9 mph, according to the weather service. Thursday night, expect a low of 21 with mostly cloudy skies and a northeast wind of 3 to 6 mph, the weather service said. Friday, the high will be near 34 with partly sunny skies and a northeast wind of 5 to 7 mph, according to the weather service. Friday night, it will be partly cloudy with a low of 23, the weather service said. Saturday, there will be a 40 percent chance of rain in the afternoon, with a high near 40, according to the weather service. Saturday night, it will be mostly cloudy with a low of 33, the weather service said. Sunday, expect sunny skies and a high near 49, according to the weather service. Sunday night, the low will be around 36 with partly cloudy skies, the weather service said. Monday, there is a 30 percent chance of showers with a high near 57, according to the weather service. Monday night, the low will be around 41. Tuesday, the high will be near 56, the weather service said. A fire was reported this morning at an apartment building at the 2800 block of Orville, according to fire officials. Visible fire and smoke were reported at the location just before 7 a.m., fire officials stated. The fire was quickly extinguished, according to fire officials.